Welcome to the August edition of the Inclusive Growth Bulletin. In this issue, we are glad to bring you a new study addressing the challenges facing Malawi's Social Cash Transfer Programme and new entries in the ongoing series of One Pagers focusing on non-contributory social protection programmes in countries of the Middle East and North Africa (MENA) region, this month featuring Libya, Morocco and Oman. 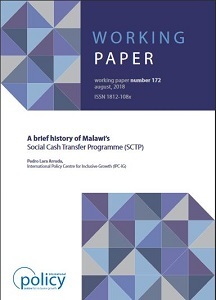 In the Working Paper "A brief history of Malawi’s Social Cash Transfer Programme (SCTP)", Pedro Arruda (IPC-IG) discusses the challenges faced by the country's flagship cash transfer programme between 2006 and 2016, presenting its relevant features, actors, and describing its targeting and selection processes, as well as funding changes over time. The paper concludes by discussing potential ways to deal with the main challenges facing the SCTP and social protection in general in Malawi. 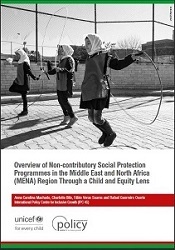 Continuing the series of One Pagers featuring each of the 20 countries mapped in the original study titled "Overview of non-contributory social protection programmes in the Middle East and North Africa (MENA) region though a child and equity lens", this month we bring you a new batch, featuring Libya, (Arabic, English, French and Portuguese), Morocco (Arabic, English, French and Portuguese), and Oman (Arabic, English, French and Portuguese). The previously released One Pagers in this series include: Algeria (Arabic, English, French and Portuguese); Bahrain (Arabic, English, French and Portuguese); Djibouti (Arabic, English, French and Portuguese); Egypt (Arabic, English, French and Portuguese); Iran (Arabic, English, French and Portuguese); Iraq (Arabic, English, French and Portuguese); Jordan (Arabic, English, French and Portuguese); Kuwait (Arabic, English, French and Portuguese) and Lebanon (Arabic, English, French and Portuguese). Additionally, under the scope of this project, the Centre has released the Executive Summary of the study in Arabic, English, and French. Our colleagues and partners at the socialprotection.org online platform received Mr. Christof Kersting, Mr. Jakob Lessin and Ms. Alice Guimarães, representatives from the German Development Cooperation (Gesellschaft für Internationale Zusammenarbeit GmbH—GIZ, one of the platform’s main donors, on behalf of the German Federal Ministry of Economic Development and Cooperation (BMZ), for technical meetings on future projects and global partnerships on social protection, from 31 July to 1 August, at the IPC-IG's office in Brasilia. .
IPC-IG Senior Research Coordinator Diana Sawyer presented the scope of the work of the Centre and its current projects, while Ipea Researcher and IPC-IG Research Associate Luis Henrique Paiva delivered a compelling presentation on current social protection issues in Brazil. 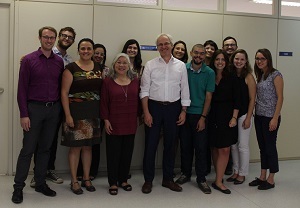 Senior Project Officer Mariana Balboni and the socialprotection.org team presented the platform’s current status, accomplishments and challenges, in light of its three-year anniversary next September. As part of its knowledge-sharing activities, this month two interesting webinars will be hosted on the platform. On 16 August, the webinar "Farmers' Registry—a tool in support of small scale agriculture and rural poverty reduction", organised by the Food and Agriculture Organisation of the United Nations (FAO), will argue for these databases as important social protection, management and statistical tools, presenting case studies. Register for free here. On 23 August, IPC-IG, UNICEF and the United Nations Office for South-South Cooperation (UNOSSC) will organise the webinar "Scaling and strengthening early childhood development (ECD) initiatives through South-South cooperation", an activity under the scope of the Community of Practice on South-South Cooperation for Children (CoP-SSC4C). The webinar will present three projects that highlight the added value of South-South cooperation in bringing to scale and sustaining ECD initiatives: one between Brazil and São Tomé and Príncipe; the second gathering Cuba, Bolívia and Honduras, and the third in Turkmenistan. Register for free here and visit the platform to learn more about upcoming webinars. 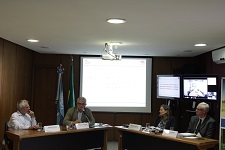 IPC-IG Researcher Mario Gyori recently presented the results of the Social Behaviour Change Communication (SBCC) Project in Mozambique, which is being jointly developed by the Centre and the World Food Programme (WFP) Mozambique, in two international conferences. On 26 June, he chaired the session titled "Infant Health and Mortality" and presented the paper “Social learning to improve health and nutrition of infants in Mozambique”, during the Conference of the European Society for Population Economics (ESPE), held in Antwerp, Belgium, from 25 to 27 June. On 13 July, he presented the same paper while chairing a session on health care and development, at the European Health Economics Association (EUHEA) Conference 2018: “Shaping the future: the role of health economics”, held in Maastricht, Netherlands, from 11 to 14 July. The paper analyses the effectiveness of a social learning campaign implemented by the WFP in Mozambique, which aims at improving the health and nutrition outcomes of children from extremely poor families during their first 1,000 days of life. Read more about how this project is testing innovative approaches to improve the health and nutrition of children through both interpersonal communication and community-based radio spots. IPC-IG Senior Research Coordinator Fabio Veras participated in the GW4 Research and Policy Seminar: “Transnational transformations in social protection: concepts, instruments and contexts”, held at the University of Bath, on 2 July 2018. He delivered a presentation titled “The expansion of non-contributory social protection worldwide and its implications for SDG 1: monitoring by the International Labour Organization(ILO) and the World Bank”. IPC-IG Senior Research Coordinator Fabio Veras and Consultant Maria Hernández travelled to Panama City from 6 to 10 August, to participate in the second phase of a capacity development course on the use of poverty analysis in the design, implementation, and monitoring and evaluation of multisectoral policies to achieve Sustainable Development Goals (SDGs) 1 and 2. Participants included officials from the Ministry of Social Development (MIDES), the Technical Secretariat of the Social Cabinet, the Ministry of Economy and Finance, and the National Secretariat for Food and Nutritional Security. The first and virtual phase of the course in Panama was held on 2 July and was hosted on socialprotection.org. Read more here (in Spanish). This course is also being implemented in Morocco, where its second phase took place between 25 and 29 June, in Rabat. Read more about the course here (in French). Both courses are part of a UN-UN partnership agreement between the IPC-IG and FAO Rome. On 10 August, the IPC-IG hosted a new session of its 2018 Seminar Series. These events represent an opportunity to share knowledge and promote debates around current issues of the global development and distributive agendas. For the Seminar "South-South and Trilateral Cooperation: the view from the North", the Centre invited three renowned specialists: Phillipe Orliange, French Development Agency (Agence Française de Développement - AfD)'s Regional Representative for Brazil and Argentina, and Director of the AfD branch in Brasília, Thomas Giblin, Senior International Advisor for the United Kingdom's Deparment for International Development (DFID) Brazil, and Alice Guimarães, Coordinator of the Brazil-Germany Trilateral Cooperation Programme for the GIZ in Brazil. Each speaker provided their institution's perspective of the challenges and opportunities for South-South and trilateral cooperation, as well as their main projects, working areas and partners.